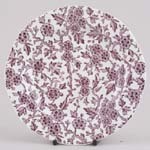 Plum China - 110 items found. 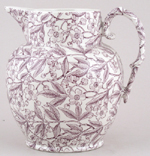 This appears to be a pattern that Burgess & Leigh inherited from Samuel Alcock, although it is is quite high Victorian in style and printed in purple. Between 1868 and 1878 Burgess & Leigh actually traded as Burgess, Leigh & Co. The glaze is finely crazed and there is a little light staining here and there, but overall excellent condition. Printed backstamp of floral cartouche with beehive with Paris in ribbon and B L & Co beneath. Made in England. Brand new and first quality, dishwasher and microwave safe. Plum Arden. This item has been discontinued by Burleigh and this item is no longer available. Made in England. Brand new and first quality, dishwasher and microwave safe. Plum Arden. This item has been discontinued by Burleigh and is no longer available. Made in England. Brand new and first quality, dishwasher and microwave safe. Plum Arden. Replacement lid for the smaller round 1 pint 0.6 ltr teapot. Minor variations in size may result in a replacement lid fitting less well than the original. This item has been discontinued by Burleigh and is no longer available. Made in England. Brand new and first quality, dishwasher and microwave safe. Plum Arden. Replacement lid for the larger round 1.75 pint 1.05 ltr teapot. Minor variations in size may result in a replacement lid fitting less well than the original. This item has been discontinued by Burleigh and is no longer available. Made in England. Brand new and first quality, dishwasher and microwave safe. Plum Arden. Rectangular tub type with flat cover, holds about 1lb of butter. This item has been discontinued by Burleigh and is no longer available. Made in England. Brand new and first quality, dishwasher and microwave safe. Plum Arden. Large serving plate. This item has been discontinued by Burleigh and is no longer available. Made in England. Brand new and first quality, dishwasher and microwave safe. Plum Arden. Saucer 5.75 ins 14.5 cm diameter. This item has been discontinued by Burleigh and is no longer available. Made in England. Brand new and first quality, dishwasher and microwave safe. Plum Arden. Saucer 6.5 ins 16.5 cm diameter. This item has been discontinued by Burleigh and is no longer available. Made in England. Brand new and first quality and the ceramic tiers are dishwasher and microwave safe. Larger tier plum Prunus, smaller tier plum Asiatic Pheasants. Metal finish may be Silver or Bronze. Dismantles flat for storage. This item has been discontinued by Burleigh and is no longer available. Made in England. Brand new and first quality, dishwasher and microwave safe. Plum Asiatic Pheasants. This item has been discontinued by Burleigh and is no longer available. Made in England. Brand new and first quality, dishwasher and microwave safe. Plum Asiatic Pheasants. This item is also available in a gift box. This item has been discontinued by Burleigh and is no longer available. Made in England. Brand new and first quality, dishwasher and microwave safe. Plum Asiatic Pheasants. Rectangular Rectangular tub type with flat cover. This item has been discontinued by Burleigh and is no longer available. Made in England. 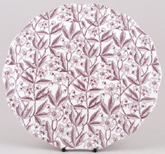 A lovely mug and plate set, printed in plum with motifs of the traditional prunus pattern and inscription "God Bless our Queen" with crown. 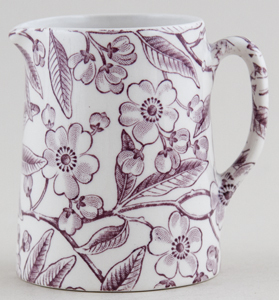 Hand crafted and decorated using traditional methods at the last working Victorian pottery in Staffordshire, England, part of a heritage of fine manufacturing stretching back over 200 years. This item has been discontinued by Burleigh and is no longer available. Made in England. Brand new and first quality, dishwasher and microwave safe. Plum Heritage, with Calico border decoration. This item has been discontinued by Burleigh and is no longer available. Made in England. Brand new and first quality, dishwasher and microwave safe. Plum Prunus. This item has been discontinued by Burleigh and is no longer available. Made in England. Brand new and first quality, dishwasher and microwave safe. Plum Prunus. 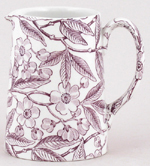 This item has been discontinued by Burleigh, but limited stocks remain available. Made in England. Brand new and first quality, dishwasher and microwave safe. Plum Prunus. Rectangular tub type with flat cover. This item has been discontinued by Burleigh and is no longer available. Made in England. Brand new and first quality, dishwasher and microwave safe. Plum Prunus. Saucer 5.75 ins 14.5 cm diameter. This item has been discontinued by Burleigh and is no longer available. Made in England. Brand new and first quality, dishwasher and microwave safe. Plum Prunus. Saucer 6.5 ins 16.5 cm diameter. This item has been discontinued by Burleigh and is no longer available. Made in England. Brand new and first quality, dishwasher and microwave safe. Plum Prunus. This item has been discontinued by Burleigh and are no longer available.